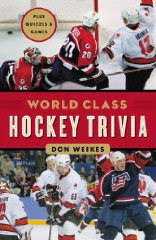 This is Don Weekes new book World Class Hockey Trivia, one of two new trivia books out by everybody's favorite trivia king. This book is all about international hockey, which is timely considering the Olympics are coming. Olympics, Canada/World Cups, world championships, the 1972 Summit Series...they're all covered. The questions and games are challenging - I should know, I had the great pleasure on working on this book with Weekes. The other Don Weekes entry of 2009 is The Biggest Book of Hockey Trivia. Big it is! There is 576 pages with over 800 questions!